ROCKFORD, Ill. – The Rockford IceHogs today announced that tickets for the first round of the 2018 Calder Cup Playoffs will go on sale Monday, April 16 at 10 a.m. Tickets can be purchased by calling (815) 968-5222, online at IceHogs.com, in-person at the BMO Harris Bank Center Box Office in downtown Rockford and at any Ticketmaster outlet, including Wal-Mart. Only tickets for Rockford’s two home games (Games A and B) in round one will go on sale at this time. Prices will remain the same from the regular season into the opening round of the Calder Cup Playoffs, ranging from $9 to $29. The IceHogs’ first-round opponent and game schedule will be announced later this weekend. Embodying its playoff campaign of “Our Team, Our Time,” Rockford rallied from a sixth-place ranking in the Central Division to notch points in 16 of the last 19 games since Feb. 24. The IceHogs’ sprint down the stretch run of the regular season included a season-high six-game winning streak that helped the Hogs leapfrog the Iowa Wild and Milwaukee Admirals, and fortify their position within the top four teams of the Central Division. 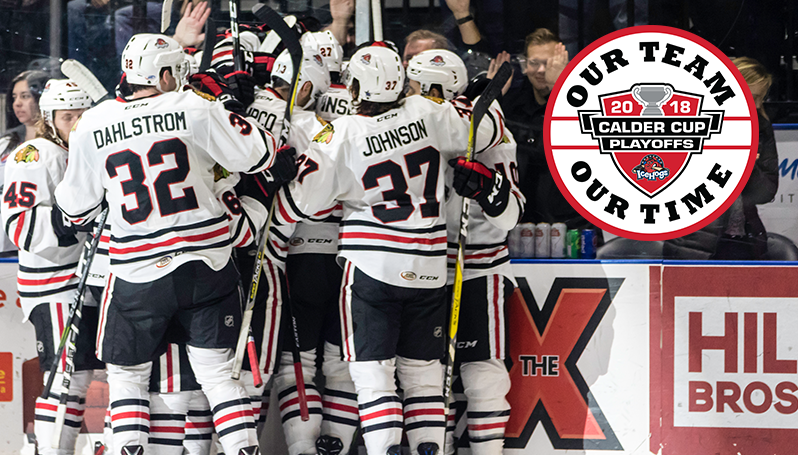 The IceHogs clinched their berth on Tuesday, April 10 in Iowa.